In this award winning novel, Maggie Stiefvater takes readers to the fictional island of Thisby where flesh eating water horses, better known as capaill uisce, inhabit the surrounding waters. Thisby is home of the annual Scorpio Races where islanders attempt to train and race the capaill uisce and tourists travel from all around to see the race. Kate "Puck" Connolly lives with her two brothers, Gabe and Finn. Their parents were killed by a capaill uisce and they were left to take care of one another. Gabe, Puck's older brother, decides that he can no longer stand to live on the island of Thisby, and makes plans to move to the mainland. 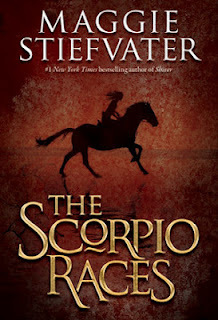 In an attempt to stop him Puck decides that she will race in the Scorpio Races, but cannot bear to ride one of the capaill uisce that killed her parents. She instead decides to ride her land mare, Dove. Sean Kendrick, four time winner of the Scorpio Races, longs to be free of his current employer and owner of most of the island, Benjamin Malvern. Malvern refuses to sell Sean the capaill uisce, Corr, that once belonged to his father. But this year, Malvern has agreed to sell Corr to him if he wins the race. 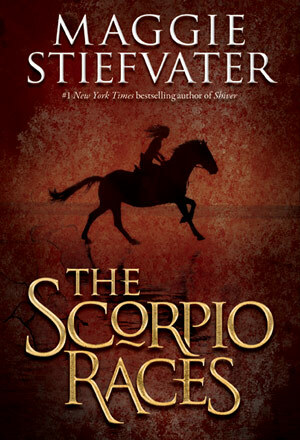 Who will win the Scorpio Races? A large cash prize awaits whomever crosses the finish line first. Both Puck and Sean need the money, but someone will come back empty handed. The first books I read by Maggie Steifvater were The Wolves of Mercy Falls trilogy. I really enjoyed them and even had the opportunity to meet Maggie at a conference I went to in 2011. At this conference she was handing out (and signing) free copies of The Scorpio Races. I have been meaning to pick it up and read it for some time now, but just haven't had the chance. I was further motivated to read it when Maggie won a 2011 Printz Honor Award for the book. It definitely deserved the award. I love how she develops her characters and how she creates the setting of the island of Thisby. As I was reading, I kept thinking that I would really like to visit Thisby only to have to remind myself that it does not exist. While I definitely love Sean and Puck, I think that Puck's younger brother Finn is my favorite character. He is quite humorous and I love his interactions with the other characters in the novel. Lastly, I will say that Maggie's prose in this novel are just beautiful. I loved The Scorpio Races so much that my next read is her new book that I received an advance copy of: The Raven Boys. It is part of a four book series and is due to come out in September 2012. I am so glad you liked this, Emily. I have really become a fan of Maggie Steifvater. Her first series was decent, but this stand alone book was fabulous. I am really liking The Raven Boys series so far. There are suppose to be four books! I would love to catch up soon.